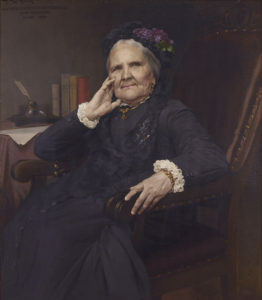 For Johanna-Desideria (Désirée) Berchmans (1811-1890), often known by her married name Courtmans, the purpose of literature was to make a difference to society. The novel was moralisation and enlightenment by other means. (Louise Otto-Peters, whom we looked at in a previous post, took a similar approach but it was even more prevalent in Belgium due to the absence of a substantial educated public for literature in Flemish.) There were other women writers connected to the Flemish Movement, such as Marie Doolaeghe, but Courtmans-Berchmans was probably the most important female author active in the Flemish literary revival of the mid-nineteenth century. Although she only turned to prose in her 40s, she became a prolific novelist, producing a book every year and sometimes more. As her father was a teacher, her husband was a teacher, her daughters were teachers, and she herself attempted to run a boarding school in Maldegem, it is perhaps not surprising that schools feature regularly in her novels. But education was not just her theme, it was her mission. 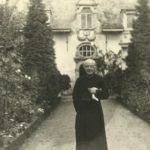 Schooling, and particularly girls’ schooling, was a political battleground in nineteenth-century Belgium, and both in her life and her fiction Courtmans-Berchmans was a combatant. Her novel De hut van tante Klara (1864) was an indictment of the lace schools: her title – with its deliberate echo of Harriet Beecher Stowe’s Uncle Tom’s Cabin (1852) – implied that children’s lacemaking was a form of slavery. 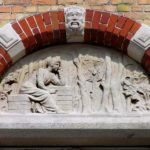 As discussed in our previous blog about Father Constant Duvillers and the lace-school in Middelburg, the 1840s were the ‘Hunger Years’ in Flanders, a situation brought on by overlapping crises in the linen industry and in agriculture. Famine was only averted by the coordinated action of local elites, particularly the Catholic Church and landowners, with the aid of the Belgian state. They sponsored lace-schools, which provided an alternative source of income to a population which had previously been dependent on flax-spinning. However, this was not a purely charitable endeavour; lace-schools, even those that received philanthropic support or subventions from the local authorities, needed to make money to remain open. A few provided some hours of basic teaching in the three Rs, but most were more workshops than schools, and the persons in charge – usually members of religious orders but sometimes private individuals – were also intermediaries in the lace trade, bound up in a network of commercial relationships. In consequence, the schools were regularly denounced for economically exploiting their young charges, while damaging their bodies and minds in the process. The Roeselare Chamber of Commerce, for example, used its annual report for the year 1864 to the Belgian Government to condemn the lace-schools: ‘The false mask of devotion to the working class fails to hide what is in most cases the spirit of avarice, pushed to its most extreme limits and which sacrifices the health, the education and the future of these poor slaves, wretchedly deceived and abused, to this greed.’ The American Civil War was still being fought in 1864 so the use of the term ‘slaves’ was deliberate. 1864 was also the year that Berchmans-Courtmans published her novel De hut van tante Klara. How did she become involved with lace? To answer this we need to go back a little in her biography. Her father had been mayor of the village of Mespelare near Dendermonde in East Flanders (he was the model for the hero of her eponymous novel De burgemeester van 1819 ). At the age of nine she was sent to a boarding-school in the French speaking part of Belgium; at the time a good education for a woman meant first and foremost learning French. In 1835 we find her lodging in Ghent with Coleta Tanghe, a lacemaker and dealer. (In her letters Berchmans referred to her as ‘Aunt Colette’, but the precise family relationship is unclear.) Also lodging in the same house was the young teacher Jan-Baptist Courtmans (1811-1856), and in very short order the pair fell in love, married and started a family, all while living with ‘Aunt Colette’, as they would for most of the next decade. Courtmans was secretary of the Maetschappij van Vlaemsche Letteroefening [The Society for Flemish Literature], which united many of the leading writers in the nascent Flemish movement such as Jan Frans Willems, Prudens Van Duyse and Ferdinand Augustijn Snellaert. The Courtmans family played host to visiting German writers such as the folklorist Johann Wilhelm Wolf, and Désirée narrated some of the folktales that made up his Niederländische Sagen (1843). She was also launching her own writing career. As with almost all Flemish authors in the wake of Henrik Conscience’s De Leeuw van Vlaenderen (1838), her first poems drew on Flanders’ romantic, medieval past, although she particularly highlighted the contribution of women, especially queens, to the cause of national independence. In 1843 the Courtmans moved to Lier when her husband took a position as professor of Flemish at the Teacher Training College. For the next decade, as the family continued to grow, her literary output shrank, but when Jan-Baptist became too ill to work (he would die in 1856), she took up her pen again, in part to earn money. 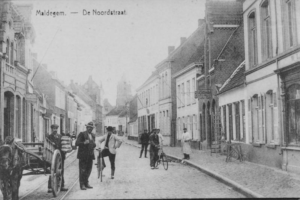 After her husband’s death, and with eight children in tow ranging in age from three to nineteen, she moved to the small town of Maldegem. Why she chose this location is a bit obscure, but she had a definite plan: she would open a girls’ boarding-school with herself and her elder daughter as teachers. She placed adverts in the local newspapers. The house she chose was on Noordstraat, directly opposite the lace-school run by Father Vinckier, Maldegem’s priest from 1832 to 1872. The two quickly, indeed almost immediately, became bitter opponents. Noordstraat Maldegem was one of many small-town front lines in the culture wars between clericals and liberals that divided Belgium politically. Courtmans-Berchmans considered herself a good Catholic, but she was a liberal in political matters. Like Duvillers in Middelburg, which was only a walk away, Vinckier intended to dominate his parish, and the lace-school was one of the means to achieve this end. It had been founded as a private initiative in 1842 but was taken over by Vinckier in 1845 or 1846. (Perhaps he had been inspired to do so after paying a call on Duvillers’ school: visiting priests were common characters in the latter’s songs.) In the mid 1850s more than 300 girls, the bulk of the available juvenile, female population, attended. More than one story is told about Vinckier’s first encounter with Courtmans-Berchmans, but the gist of them all is he told her that Maldegem had no need of educated women and so she had better set up shop elsewhere. Her reply was ‘ik blijf’ [I’m staying]. 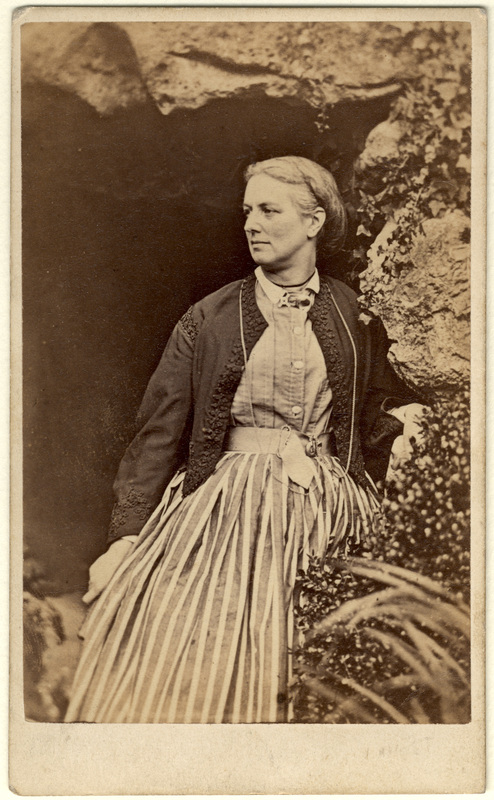 However, she lost the first battle in her personal ‘culture war’ when her boarding-school was wound up in 1858 due to, as she explained to the local council, ‘malicious obstruction’. As it was around this time that she started seriously writing again, the cause of literature gained by the failure of her boarding-school ambitions. But in 1857 a new front opened up. 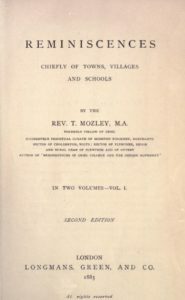 Municipal provision of some sort of primary schooling had become law in 1842, but in the 1850s the Liberal government began to put pressure on councils to build separate schools for girls. Unlike the lace-schools these would not be places of work but would teach reading, writing and other skills. They would be free to those unable to pay, which was the majority of the population in Maldegem. The ecclesiastical authorities were worried that these public schools would compete with the lace-schools, and thus draw the female population away from their control. One solution was, therefore, to convert the lace-schools into public schools by introducing a few extra lessons in reading and writing. This was the strategy suggested by the Archbishop of Bruges and initially followed by Vinckier. He proposed that Sophie Westerlinck, the mistress of his lace-school, should be appointed Maldegem’s first teacher of the girls’ public school, which would succeed the lace-school. However, Courtmans-Berchmans was simultaneously lobbying hard to ensure that her daughter Mathilde got the post. 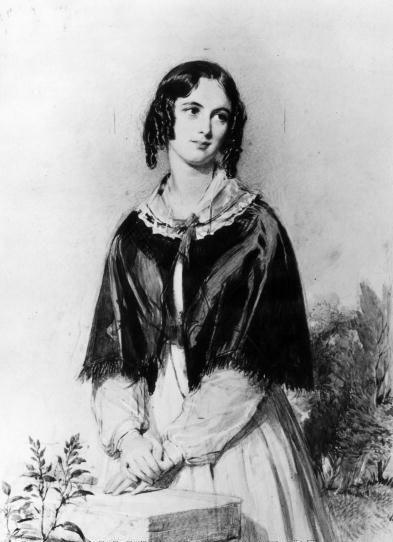 After much dithering by the council, she gained the cause, and Mathilde Courtmans was appointed on 3 February 1858. Several of her sisters would join her as teachers in due course. Yet this was not the end of the struggle. Education was provided, but parents were not obliged to take it up. Through the 1860s and 70s the lace-schools, both Vinckier’s and other establishments in Maldegem, continued to attract more pupils than the public school. Girls in the lace schools earned money which helped support their families, and in ‘Poor Flanders’ this support could be vital to a family’s survival. But the Church had other ways of exerting control. In 1879 a new Liberal government attempted to laicise primary education in Belgium but the Church hierarchy fought back, threatening to excommunicate all teachers and all parents of pupils attending state primary schools. In rural Catholic Flanders the effect of the first ‘School War’ (Schoolstrijd) from 1879 to 1884 was to empty the state primary schools and thus put the Courtmans sisters out of work. However, this defeat lay some years off. During the 1860s Courtmans-Berchmans was battling for decent schooling for Flemish girls on several fronts: with the local council (to whom she complained about the condition of the school buildings, and especially the playground, as she was convinced of the need for physical activity and fun as part of a rounded education), in the local papers such as De Eecloonaer where she berated her fellow citizens for their parish pump politicking, and in her novels, such as De hut van tante Klara. No works by Courtmans-Berchmans are available in English (to our knowledge) but sections of this novel were translated by Brenda Mudde, and commentated on by Lia Van Gemert, in the latter’s collection Women’s Writing from the Low Countries, 1200-1875: A Bilingual Anthology (Amsterdam University Press, 2010). The eponymous heroine, Klara Roman, is a herb-gatherer and the widow of a supposed ‘jacobijn’ barber-surgeon (Jacobin was a term of abuse aimed at anyone with liberal or anticlerical ideas). Living with her are two orphaned granddaughters, Mieke and Roza, or Mieken and Rozeken as they usually appear in the text (along with their father, an unimportant character). An industrial accident will soon rob her of her other son-in-law, and her other daughter with her tiny children will also take up residence in her crowded cottage. At first, though, all seems idyllic, the six-year-old Mieken and Rozeken playing in the healthy outdoors while Klara picks her herbs for the apothecary. Yet there is a presentiment of tragedy: the girls weave crowns of flowers that make them resemble two virgin martyrs. Into the scene walk the agents of misfortune, the sisters Ludgarda and Rosanna Devroede, offspring of a disgraced notary. They have come to persuade the local landowner, Mevrouw Van Dooren, to set up a lace-school which they will run. Van Dooren wants to help a population suffering through the linen crisis. But she is also an enlightened philanthropist, so the rules she lays out for her lace-school specify that children under nine should only work for three hours a day on lace, that there should be lessons in other subjects, plenty of play-time, and that the children themselves should receive the profit from their work. This is not at all to the Devroede sisters’ liking, but they accept the position, and soon the old village spinning house is converted into a lace-school. You are undermining the pillars of society. You drive the insignificant upwards in order to bring down the great. You wish to give the vermin wings so that they may rise up with the eagle, and you don’t even seem to understand that one swipe of its claws can crush thousands of these insects… Artificial reading will grow into exercises to develop the mind, and then what – what will become of society once we get that far? Oh, Madam, I am saddened, saddened to the soul when I think of it. Although not a priest, fat Mr Hardies with his sanctimonious shows of piety, is a thinly disguised portrayal of father Vinckier. Mrs Van Dooren, fortunately, is equal to this pressure. For three further years (we are now in the late 1840s), until they are nine, Mieken and Rozeken continue at the school with Klara’s blessing. They learn, they earn and they remain healthy. But then their benefactor dies, and a new regime is established in the lace school. 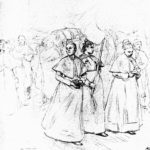 All the poor girls in the parish are obliged to go, or their families will cease to receive charity: within a month there are 400 girls in the school. All other classes are stopped, as is playtime. The children are charged for the thread and other equipment, which had previously been a cost of the establishment. According to Aunt Klara the luckiest are those who die young, but those that survive this ‘kinderslavernij’ [child slavery] will become feeble housewives, with their twisted hands. The fate of her two grandchildren under this new order is very different. Mieken is constantly punished with the ‘zottekap’ [dunce’s cap] and the ‘lange tong’ [a wooden board hung on a pupil’s back as a mark of shame] for not fulfilling her lace quota, she is beaten with rods and made to sit near the door, far from the warming fire; soon she is coughing and fading. Rozeken, however, with her ‘downcast eye’ [a regular sign of hypocritical submission and devotion in the literature of lacemaking] adapts to the Devroedes’ bigotry and greed, and so is rapidly promoted. She transfers designs onto the parchments used by the pupils, particularly the ‘Brusselsche bloemen’ [Brussels flowers, or Duchesse lace], a specialist job. Meanwhile Hardies has forced the Devroedes to accept his ‘protection’ and has become a silent partner in the school. The miser estimates that each girl earns at least fifteen centimes profit a day: 600 or more girls equals 100 francs a day, divided equally between Hardies and the Devroedes. The three plot to dispatch Rozeken to the convent at Zwijbeke, in order to improve their relationship with this important intermediary in the lace trade. The other girls are becoming pale, thin, pinched and ill. In fact they are dying of consumption (and this mirrors the reality: between 1852 and 1856 twelve pupils in the Vinckier lace-school died of consumption, and two others of typhus: the mayor of Maldegem wrote in 1857 that ‘the cause of death of the lace apprentices is a wasting disease to which the parents have given the vigorous name “schoolsickness”’). Their ill-health becomes very obvious on the feast of the Assumption of the Virgin Mary, 15 August, when the school parades through the town. They were headed by the two school mistresses in their black silk dresses, lace-edged coats, and pretty, white silk hats decorated with purple violets. Each had a fat gold chain with a precious watch around her neck, and there was nothing to find fault with in their beautiful attire. Then came the pupils. A sigh of pity escaped each breast on seeing these pale creatures, these stunted limbs, these thin bodies, which seemed to be fighting a stubborn battle of life and death. Never had poverty made a more painful impression than it did now that so much trouble had been taken to adorn it. The school’s older pupils looked very neat in cotton dresses, and it was evident that their parents had done the impossible to fulfil the needs of their money-earning daughters. Among these children, the granddaughters of Aunt Clara were to be found. They were followed by the smaller children…. Hundreds of clogged little feet came clattering by. 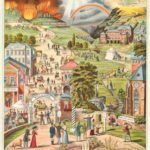 Some few were in new clogs, but many wore old ones, dripping with water and sand, and the clunking, rattling and clattering of the clogs mingled with the monotonous church hymns in such an unpleasant way that it saddened all attentive viewers. Mieken is one of the fatalities. Although she rallies for a while, long enough to start a romance with her neighbour Paulus, her funeral will also be her wedding. Her father, long since too ill to work, soon follows her to the grave. Although Rozeken’s wages would now really help Aunt Klara’s household, she follows the plan laid out by her employers and joins the convent as a novice. Aunt Klara’s other two grandchildren are now also in the lace school and one is already showing signs of the wasting sickness. At last Aunt Klara, who perhaps understandably is given to weeping, now turns defiant: she removes her grandchildren, even though this means the family cannot receive poor relief from the council, which is under the thumb of Hardies. Georges Laugée (1853-1937), Enterrement d’une jeune fille à Étricourt. Musée de l’Échevinage, Saintes. This is an example of ‘the wedding of the dead’. But times have changed. The Crimean War knocks the bottom out of the handmade lace market; the wages of the lace mistress employed by the Devroedes is halved, and even the sisters themselves cut back on their consumption of eau-de-cologne. Punishments increase in an attempt to squeeze more work out of the children, but still wages decline. For the men a new opportunity has opened up as migrant harvesters in France, so the poorer villagers are not so dependent on the lace-school. Other women start to follow Aunt Klara’s example and remove their daughters. The partners in the venture have started to bicker when Hardies drops down dead of a heart attack; he returns like Jacob Marley as a ghost, weighed down with account books and banknotes. The sisters’ father is released from prison and with him they slip away into the night. The lace-school building is put up for sale. Aunt Klara has one last task to fulfil: she goes to the convent to persuade Roza to renounce her noviciate and come back home. In her introduction Berchmans-Courtmans made explicit that this novel had a social purpose, to expose the exploitation of young girls in the lace-schools, because such institutions ‘disgraced a civilized country’. She was not against the idea that girls engaged in some work that could contribute to the household income, but that they should also receive an education that expanded their mental horizons, that they be taught useful lessons in tasks that would help them later as housewives (sewing, knitting), and that their bodies be allowed to bloom in exercise and fresh air. The campaign against the lace-schools would grow, picking up themes rehearsed by Berchmans-Courtmans, such as the impact on the reproductive potential of the Flemish population. 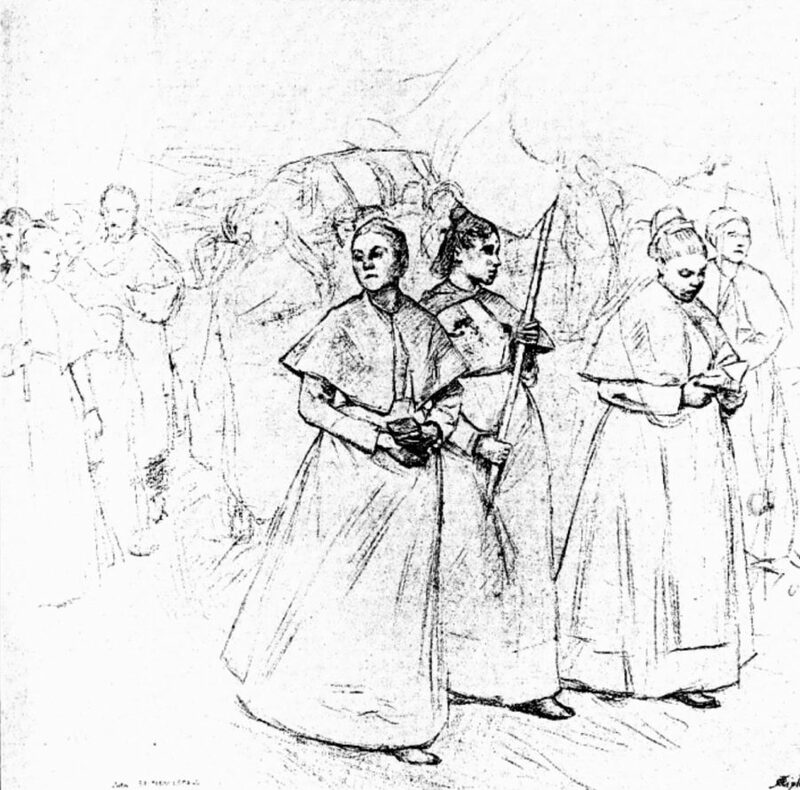 In 1876 the sociologist Guillaume de Greef launched a newspaper diatribe against the lace-schools run by religious orders and not just because they exploited their charges and condemned to poverty, ill-health and early death, but also because they sapped the intellectual and moral strength of the female population: ‘they are not even slaves, because slaves can rise up, but not they’. However, during the ‘School War’ clerical Flanders rallied to the defence of the lace-schools, which survived well into the twentieth century. 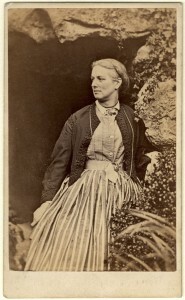 Thus they remained a theme for later Flemish writers such as Virginie Loveling (in Sophie 1885, where the Darwinian implications of a stunted female population are brought to the fore) and Reimond Stijns (in Hard Labeur 1904). Of course the fate of the ‘hard worked, half-stifled little girls’ in the lace schools was not just a campaigning matter for Flemish writers, as we have already seen in the case of Charlotte Yonge’s The Clever Woman of the Family, published the year after De Hut van Tante Klara. Jules Bastien-Lepage, Funeral of a Young Woman at Damvillers, c. 1880. Doolaeghe (1803-1884), to whom we may return, wrote an encomium for ‘my noble friend’ Courtmans-Berchmans in 1883, in which she praised her efforts to ‘enlighten the people through her writing’ [Het volk verlichtend door zijn woord]: ‘Hulde aan mijne hooggeachte vriendin Mevr. Courtmans, geboren Berchmans’, De Vlaamsche Kunstbode 13 (1883): 261-2. There are several biographies and other studies of Courtmans-Berchmans: I have drawn mostly on Hugo Notteboom, Rik Van de Rosteyne and Michiel de Bruyne (eds) Over Mevrouw Courtmans Leven en Werk (Maldegem: Mevrouw Courtmanscomité, 1990); and Jules Pée, Mevrouw Courtmans, een letterkundige studie, (Antwerp: Ruquoy, Delagarde, Van Uffelen, 1933). Johann Wilhelm Wolf, Niederländische Sagen (Leipzig: F.A. Brockhaus, 1843), p. xxi. German philologists such as Wolf played an important part in the Flemish revival. For the ‘culture wars’ in Belgium, see Els Witte, ‘The Battle for Monasteries, Cemeteries and Schools: Belgium’, in Christopher Clark and Wolfram Kaiser (eds), Culture Wars: Secular-Catholic Conflict in Nineteenth-Century Europe (Cambridge: Cambridge University Press, 2003). Lia Van Gemert (ed. ), Brenda Mudde (trans.) Women’s Writing from the Low Countries, 1200-1875: A Bilingual Anthology (Amsterdam, 2010), pp. 523-4. Guillaume Degreef, L’ouvrière dentellière en Belgique (Brussels, 1886), p. 8. The 1886 volume is a new edition of his newspaper articles. 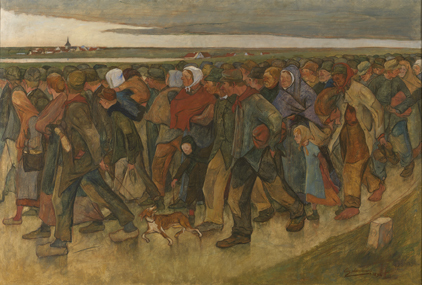 Eugène Laermans, ‘The Emigrants’ (1894). Musée des Beaux-Arts, Brussels. Migration was one of the consequences of the Flemish linen crisis of the 1840s. However, this post concerns his time at his first parish ― Middelburg ― where he served from 1836 to 1854. This village sits right on the corner where East and West Flanders meet the border with the Netherlands. It is in ‘Meetjesland’, a nickname for the region that Duvillers popularized through his annual Almanak van ‘t Meetjesland, which he published under the pseudonym ‘Meester Lieven’ from 1859 until his death. The story Duvillers told (and possibly invented) was that, when the locals learnt that the notorious womanizer Emperor Charles V was to travel through the region, they hid all the young women and only old women were visible, leading the Emperor to exclaim ‘This is little old lady land’ [Meetje is a colloquial term for ‘granny’]. The almanac, with its plain-speaking moralizing and practical advice, demonstrated Duvillers’ commitment to popular education and the promotion of the Flemish language. There was nothing he disliked more than a Fleming putting on French airs, or a ‘Fransquillon’ to use the pejorative term popularized in the 1830s, and the subject of a bad-tempered satirical poem by Duvillers, ‘De Fransquiljonnade’ (1842). For Duvillers and many other Flemish priests, French was the language of Robespierre, of irreligion and revolution. Inoculating the good Catholic Flemish population against this toxin required the provision of wholesome and comprehensible literature in their own language. Duvillers was responsible for a host of such small, cheap books, often pseudonymous, which, like his almanac, mixed the homely wisdom and folk humour of proverbs with overt moralizing and religious instruction. The proverb was one of Duvillers’ favourite genres, the song was another. Among his publications are three books of songs, the first of which (1844) was dedicated for the use of the Middleburg girls’ school: several of its twenty songs refer to lacemaking. In 1846 and 1847 there followed two more volumes containing fourteen and fifteen songs respectively, which were intended for use in the lace schools. The background to these publications was the devastating crisis that affected Flanders principal industry, linen manufacturing, during the 1840s. In 1840 linen occupied nearly 300,000 people in Flanders, about twenty per cent of the population. They were employed in their own homes as spinners and weavers, supplementing their incomes by growing their own food on smallholdings. By the end of the decade this entire sector had all but disappeared. The causes included competition from British factory-produced linens and the displacement of linen by cotton, but this crisis in manufacturing was also exacerbated by poor harvests in the late 1840s, the same period as the Irish Potato Famine. Unemployment and high food prices coincided with typhus and cholera epidemics. For the fledgling Belgian state, born out of an earlier revolution in 1830, misery and starvation in Flanders presented a crisis of legitimacy. In other European countries the ‘Hungry Forties’ led to protest and even the overthrow of the political order. How could that outcome be avoided in Flanders too? One answer was to retrain the population to make lace. This might seem an odd choice given that machine-made lace was already a source of competition for Flemish handmade lace. Nottingham and Calais tulle had effectively wiped out Lille’s lace industry in the 1830s. But the fashion for tulle had crashed, and the market for Flemish Valenciennes lace was sufficiently recovered for this project to make sense. Up until 1830 lacemaking had been a largely urban manufacture in Flanders, but in the 1840s it would desert the cities such as Antwerp and Ghent (though not Bruges) to take up its abode in the countryside, and especially in the villages of West Flanders that had been most affected by the linen crisis. However, lacemaking is not a skill acquired overnight: it required teachers and schools. According to the historian of the Belgian lace industry, Pierre Verhaegen, ‘it was now that, under the influence of humble parish priests, of charitable persons, and some convent superiors, the lace industry suddenly took flight again. In the convents of the two Flanders and Brabant, children started to be taught to make lace; where there was no establishment of this kind then one was founded and soon there was hardly a convent in Flanders which did not possess a lace school. New female congregations of nuns sprang up and gathered around themselves the children of the villages where they were implanted.’ This describes the role of Duvillers in Middelburg: at his initiative local elites provided the funding for a lace school, and the staff was supplied by one of the new teaching congregations of nuns. There are many ironies to this story. The political cleavage in the young Belgian state was between the liberals and the clericals. During the 1840s the liberals, who were largely French speaking and anticlerical, were the dominant party, but their response to the linen crisis, including the funding of the lace schools, required their collaboration with their political arch-rivals, the Flemish clergy. Later in the century, the creation of hundreds of lace workshops masquerading under the name ‘school’ created a new battlefront in ‘culture wars’ between clericals, liberals and, later, socialists. In the meantime, hundreds of thousands of young Flemish women were trained in a trade that effectively trapped them in poverty. For liberals, the failure of the clergy to provide a decent education for their charges, as well as the profits the Catholic Church drew from their ignorant, emaciated and tubercular lace apprentices, was a scandal. 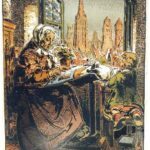 For socialists, the impoverished lacemaker became a symbol for ‘Arm Vlaanderen’ [Poor Flanders]: she was the personification of the entrenched misery which demanded radical action, such as the banning of domestic manufacture. But for the clergy and their supporters the homeworking lacemaker, trained by nuns simultaneously in religion and labour, was the epitome of domestic virtue. The battle over the lace schools was fought in literature as well as in the newspapers and the chambers of parliament, as we will see in future posts on the work of Johanna Courtmans-Berchmans, Virginie Loveling, Guido Gezelle, Stijn Streuvels, and Reimond Stijns, among others. All of these, however, had the opportunity to reflect after several decades on the success and failures of the lace schools: Duvillers was there at the start. The Middleburg Girls School, for whom the 1844 volume of songs was intended, was Duvillers own project, or at least so claimed a song in which trainee seamstresses thanked ‘Our Pastor, who erected this school’. This series of songs predates the onset of the linen crisis; nonetheless, the industry was clearly in trouble. In ‘The Song of the Spinners’, the speakers lament that ‘Wages are small, and living expensive/ There’s no butter on our bread’. However, at that time lacemaking was only one of the replacement trades being taught: ‘I feel motivated / always to go to school. I learn lovely things there;/ I learn how to make nice lace;/ I sew, I knit,/ it is all profitable for me’. Nonetheless lace was, to judge by the number of songs on the topic, the dominant occupation taught in the school, and Duvillers was clearly on a mission to promote it: ‘O blessed land!/ Where even small a small child’s hands/ Can sustain her parents,/ By playing, [she] can earn,/ By playing.’ Observers like Duvillers often thought of lacemaking as a form of play, an association made easier by the fact that in Flemish the terms are homonyms ― ‘spelen’ and ‘speldewerk’: ‘Here we play a game/ Where anyone might see us;/ The lace shines/ Like a genuine fairy art.’ Duvillers frequently used the term ‘toover’ – meaning magic or fairy – to describe lace, as did many other commentators on the industry. By 1846, when Duvillers’ next volume of songs appeared, lace had become the single focus of Middelburg’s and many other schools across Flanders. The first song in the volume describes the situation as the linen crisis reached its peak. 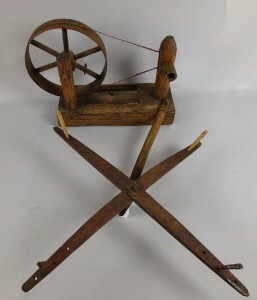 In years gone by father had sat to weave and mother to spin, and the loom and spinning-wheel together had saved the children from anxiety and grief as they could get their daily bread. But now that ‘Frenchmen wear no linen anymore’ (the French army had replaced its red linen trousers with cotton ones) the girls must go to the lace-school. Yet despite the problems besetting Flanders, Duvillers’ tone in this volume is, overall, positive. In ‘Flora, the Bold Lacemaker’, for example, the eponymous heroine sings ‘Long live lacework! 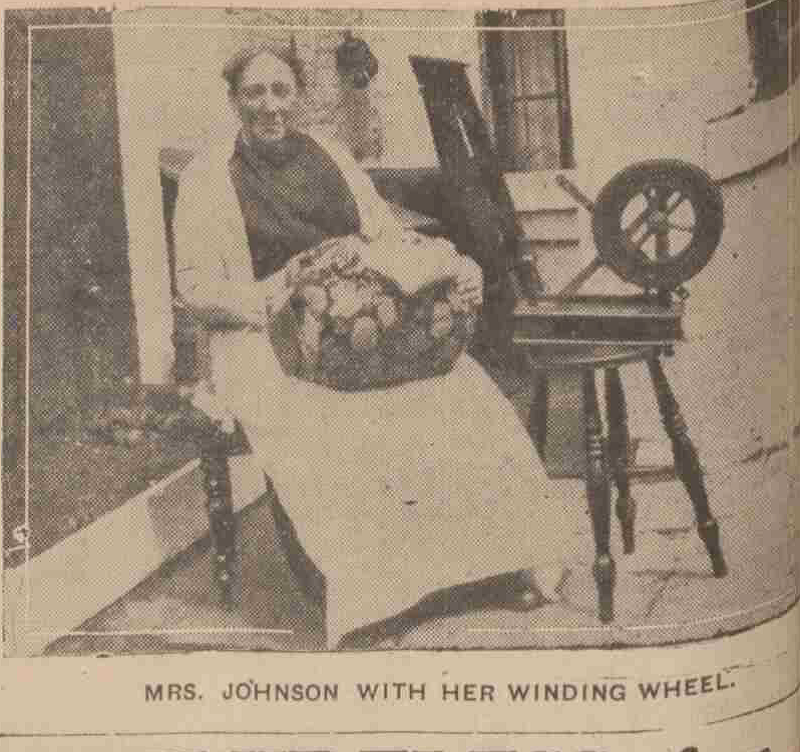 Farewell to the droning spinning wheel!/ I’ll follow the girls from the town,/ my fingers will play both large and small,/ and so Flora will earn her bread.’ Here, as elsewhere in these songs, the purchaser of the lace schools’ product is identified as ‘the Englishman’ or even ‘John Bull’. The lace school is clearly a developing proposition: one song describes the pristine building ‘on two floors!’, so much better than the ‘dark hole’ where they have been working up till now. This set of fourteen songs is essentially a promotional campaign to convince parents, and the apprentices themselves, of the benefits of the lace school. Duvillers highlights not only the monetary rewards but also that the girls can meet their friends, be warm and safe, and kept on the path of moral rectitude by ‘singing God’s praises’ and saying the rosary. However, they also sing other, secular songs ‘of the little weaver, or of the cat’ (probably references to lace tells). In particular he dwells on the fun and games held on the Feast of St Gregorius (9 May), the patron of lacemaking in East Flanders, when there would be a prize-giving attended by priest, the lord and lady from the chateau, as well as all the members of the philanthropic institute that supports the school, who will give out ‘big books clothes, hats and cloth’ to the pupils. Later the whole school will go on jaunt to Ghent. In other songs Duvillers contrasts lacemaking to other occupations in agriculture or food production that might, on the surface, appear better remunerated. For instance he relates the cautionary tale of ‘Anastasia De Bal’ who threw her lace cushion in the fire and went to work for a farmer who taught her to swear like trooper. Although she earns a tad more, she is out shivering in the fields, her clothes are worn and tattered, and the work makes her hungry and thirsty (and implicitly food is costly). And of course agricultural work stops in the winter, and then she’ll be forced to live on potato peelings and even grass. A large number of Duvillers’ songs in this and the next volume are in the form of dialogues, and between them they cover many of the daily interactions experienced in and around the lace-school. For example, apprentice Mietje meets a gentleman on her way to the school, and when he learns that she is supporting her sick father as well as six children he gives her ten francs. In the next song the priest visits the school to see how the apprentices are doing, and the lace-mistress gives a run-down on each individual’s progress, or lack of it. The priest seems to be constantly dropping in on the school, showing around other clergy who are interested in setting up their own school, or philanthropic gentry who might support the enterprise, or handing out prizes. Other visitors include the ‘koopvrouw’, the female intermediary who collected lace on behalf of the merchants in the distant cities. In another song she is named as ‘Mevrouwe Delcampo’ from Bruges, while the teacher is frequently referred to as ‘Sister Monica’. Both of these were probably real people, though so far I have been unable to verify this. Hopefully Duvillers was more careful to use pseudonyms to hide the identities of the numerous girls and young women who attended the school. Dozens are named, and in many cases in order to be upbraided. Wantje Loete, Cisca Bral, Mie d’Hont, Genoveva d’Hont, Barbara Kwikkelbeen, all had done something to annoy Duvillers. Most of these appear in the third, 1847 volume which is markedly more bad-tempered than its predecessors. In the winter of 1846-7 it appears that the children were being withdrawn from the school. Duvillers was particularly infuriated by the parents who, now their daughters had learnt the rudiments of lacemaking, kept them at home to save the few pennies that attendance at the lace-school incurred; or, just as bad, sending them out into the fields to do agricultural work. He warns Wantje Loete that once at home her cushion will stand empty because her mother will need her to look after her latest sibling, while her father will send her to look after the goats and pigs. Meanwhile she, and the other girls staying away from school, will never really master lacemaking. The issue, though, was not entirely economic: for Duvillers the key success of the school was establishing religious oversight of all the young women in the parish and it was this moral authority which parents and some girls, were challenging. All was not well in the school either: in the song ‘The School Mistress and the Foolish Mother’, the latter comes to complain that her daughter Mie has been beaten, and that she will take her, her stool and her cushion out of school if another finger is laid on her. The school mistress answers that no one has been beaten, she’s only dragged Mie into the middle of the school and made her kneel and pray because she is so lazy. And while the stool belongs to the family, the other tools belong to the school. ‘Don’t come back later and try to flatter us/ and ask us if she can [learn to] knit,/ Or even sew your clothes:/ Woman, this is no dovecot!’ However, the mistress’s protestations that no-one has been beaten are undermined by other songs in which she directly tells the children that she’s been instructed by the pastor himself ‘not to spare the rod’. Perhaps this was the reason girls like Barbara Kwikkelbeen preferred hanging around in the street or wandering through the parish. In a fury over all this backsliding Duvillers declares ‘But as the poor are so pigheaded,/ Then I will not lift my hand to help them,/ And I’ll send them a punishment.’ If these songs in any way represent the priest’s actual relations with his parishioners, then it is plausible that it was this breakdown that brought about his removal from Middelburg, and not his obstreperous involvement in language politics. As any regular visitor to this site will know, apprentice lacemakers sang while they worked. Duvillers frequently alludes to this custom, and even names some of the songs they sang, such as ‘Pierlala’. He presumably wanted his songs to be adopted by the Middelburg lace school as more suitable for future ‘brides of Christ’ (that is nuns, which was clearly Duvillers’ hope for at least some of the girls) than those currently in use, that is if his choice of tunes is indicative of what was being sung. Most of these seem derive from the theatre, such as ‘The Best is Good Enough for Me’, or ‘The Frozen Nose’. Presumably also he hoped that his songs would be taken up in other lace schools, but is there evidence of this? Although Flemish lacemakers sang a lot of songs, not many of them were actually about lacemaking itself. If anything their songs served as an imagined escape from their task. Duvillers’ songs, on the other hand, offer a detailed picture of life in a lace-school, of how the children interacted with each other, of the injunctions of the lace-mistress, of the various visitors during the day… the kind of nitty-gritty quotidian commonplaces that are a goldmine for the social historian but unlikely to excite a singer. This mundane character, and the highly localized references, made me think that, as songs, Duvillers’ work had probably fallen rather flat. However, at least one of Duvillers’ songs did become a lace tell, and a version was still sung a century after publication. In 1948 Magda Cafmeyer published a series of articles ‘From Cradle to Grave’ about life-cycle traditions in Bruges and its immediate surrounding villages. She included, under youth, lace tells, and offered one that she herself had heard. of the young ladies of the city. They seem to dance before one’s eye. But this tough one (‘schrimmer’ in Cafmeyer’s tell, ‘grimmer’ in Duvillers’ song), hardly ever leaves the house. As he quickly leaves the school. I sit here warm and clean. Unknown to Cafmeyer, these are two verses, albeit slightly rearranged, of one of Duvillers’ Speldewerksters-liedjes which appeared in his first, 1844 collection. In his own way, he had contributed to the craft culture of Flemish lacemakers. 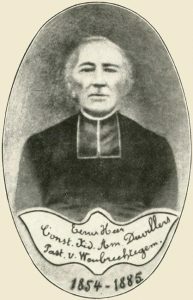 For a fuller biography of Father Duvillers, and detail of his works and his legend, see J. Muyldermans, ‘Constant Duvillers (1803-1885). Zijn leven en zijne schriften’, in Verslagen en Mededelingen der Koninklijke Vlaamse Academie voor Taal- en Letterkunde (1928): 148-202, and F. van Es, Pastoor Constant Duvillers, Folklorist en folkloristische figuur (Ghent, 1949). G. Jacquemyns, Histoire de la crise économique des Flandres (1845-1850) (Brussels, 1929). Pierre Verhaegen, Les industries à domicile en Belgique: La dentelle et la broderie sur tulle (Brussels: Office du Travail, 1891), vol. 1, p. 49. We will return to this political debate in future posts, but for liberal/socialist critiques of the Catholic Church’s involvement in the lace schools see Guillaume Degreef, L’ouvrière dentellière en Belgique (Brussels, 1886) and Auguste de Winne, À travers les Flandres (Ghent, 1902). Although Pierre Verhaegen’s father, Pierre-Théodore Verhaegen (1796-1862) was the effective leader of the Belgian liberals and anticlericals, and at the forefront of the battle over education (students at the Free University of Brussels – free of Catholic influence that is – still celebrate ‘Saint Verhaegen’s Day’), he himself took a more positive view on the Church’s lace schools. C. Duvillers, Twintig Nieuwe Liedjes, ten geebruyke der Meysjesschool van Middelburg, in Vlaenderen (Ghent, 1844): Naeystersliedje ‘O! dank zy onzen pastor:/ Hij heeft de school gesticht’. Duvillers, Twintig Nieuwe Liedjes: ‘T Liedje der Spinnetten ‘Den loon is kleyn; en ‘t is duer leven;/ Er ligt geen’ boter op ons brood’. Duvillers, Twintig Nieuwe Liedjes: Huys-liedje ‘ ‘k Voel mij gedreven/ Om altyd school te gaen./ Daer leer ik fraeye zaken:/ ‘k Leer nette kantjes maken;/ Ik naey, ik brey,/ ‘t Is al profyt voor my’. Duvillers, Liedjes voor de Kantwerkscholen (1846): De Schoolvrouw, den pastor en de dry vreemde heeren ‘Sa! Kinders, zingen wy eens dat/ Van ‘t Weverken of van de Kat’. Neither reference can be clearly identified as weavers and cats are both common characers in Flemish folksong, but two popular lace tells were ‘Daar waren vier wevers’ and ‘De katje aan de zee’. Duvillers, Liedjes voor de Kantwerkscholen (1846): no. 14. Duvillers, Liedjes voor de Kantwerkscholen (1846): Den Heer en het schoolkind. 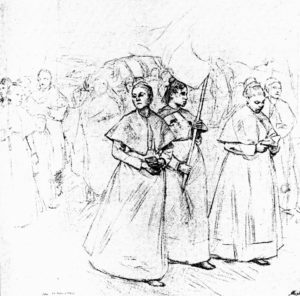 Duvillers, Liedjes voor de Kantwerkscholen (1846): Den pastor en de schoolvrouw. Duvillers, Liedjes voor de Kantwerkscholen (1846): De Koopvrouw en de zuyster. C. Duvillers, Liedjes voor de Kantwerkscholen en Spreuken van baeske Van de Wiele (Ghent, 1847): Wantje Loete. Magda Cafmeyer, ‘Van de wieg tot het graf III: Dat was de jeugd’, Biekorf 49 (1948): 206-7. This article was written and illustrated by Percy Macquoid (1852-1925), and appeared in The Graphic on the 9 January, 1892. Thanks again to the British Newspaper Archive for this find. Macquoid, whose father was also an artist and illustrator (and whose mother a popular novelist and travel writer), was a regular contributor to The Graphic but also worked as a theatre designer. He is best known now as a collector and connoisseur of English furniture, having written several of the key texts on this subject. Here he shows his concern for another “art industry” in decline, Honiton lace. Reports of this kind helped stimulate the lace revival around the turn of the century. 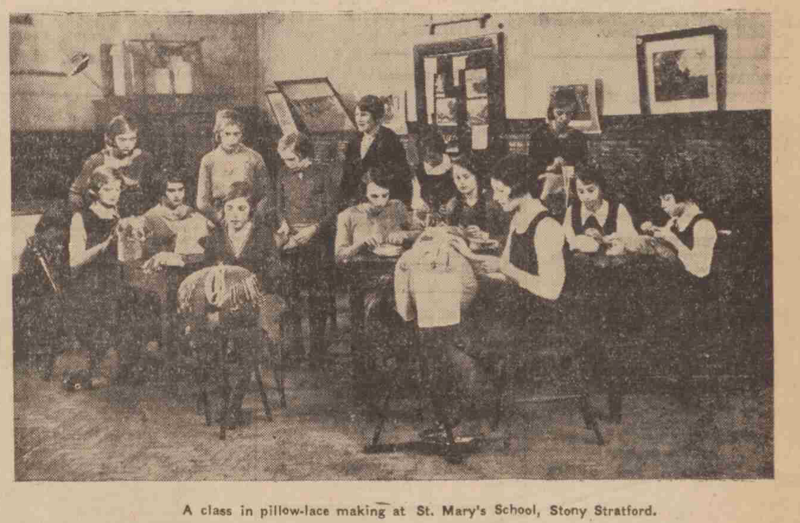 However, we have included it on this site because Macquoid provides a very rare image of the inside of a lace school. A Decaying English Industry — A Lace School in Devonshire. Drawn by Percy Maquoid R.I. The illustration represents a school for the manufacture of Honiton lace. A few years ago these schools were found in every village in the neighbourhood of Honiton. Now they are all but extinct, and where the little girls of a village were universally apprenticed to the trade, and dependent on it for their livelihood, now these same villages are more or less deserted and the young women obliged to go out to service. One of the chief reasons for this is the decay of the Honiton lace trade, owing to the demand for only the very cheap and ordinary kind. Hence the girls were no longer apprenticed to the schools for teaching the fine and elaborate stiches, and, as it is requisite to begin very young, the real art of the manufacture is now quickly dying out. Formerly the girls were apprenticed when children to any old woman of the village who was a skilled worker, and she instruct them in the various stiches, taking for payment the work they manufactured. Much greater aptitude is often shown by the girls of one family, proving it to be a transmitted art, and some of the bobbins in use now are over 150 years old, being much prized, and having been handed down from mother to daughter. Very few of the old skilled workers can now afford to keep such schools. They will tell you that there is practically no demand for the really fine Honiton, and that there are very few workers now left who can make it. The accompanying photograph shows what these old hands can still do. The thread was obtained from Belgium. A piece of fine early eighteenth century English lace was given by me as a pattern, and was exactly reproduced by one of the old skilled workers in the cottage in the illustration. It seems a hard thing that one of the few thriving Art industries of England should utterly die out, as it soon must, for the art will die with the old workers. The young girls are merely taught the ordinary coarse stitches, as there is only demand for this kind of lace now, and even this demand is gradually decreasing, and the work in consequence less and less good, and so, unless prompt encouragement is given, the art must irretrievably die out. One ‘keeps cattern’ but one ’goes tandering’. We are not sure whether this semantic difference is meaningful. Nor are we certain why Saint Andrew became the patron of Midland lacemakers, who celebrated his feast either on ‘new’ (30th November) or ‘old’ (11 December) Saint Andrew’s Day. We know no legend or song that would account for this role similar to those told about Saint or Queen Catherine, and to our knowledge Saint Andrew was not held in particular reverence by any European lacemakers. One Catholic website suggests that it was because the Saint Andrew’s cross resembles intersecting threads… But we suspect that its origins are more ecclesiastical, because Saint Andrew is the patron of many of the churches in the diocese of Peterborough. It seems likely that Tanders was once a widely held village feast and that the association with lacemaking arose as other groups forgot, or were discouraged from, celebrating the saint. 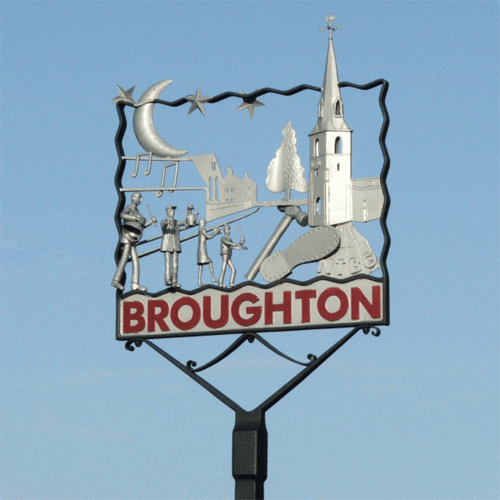 Broughton village sign, featuring its tin can band on Tanders. We borrowed this image from the ‘Broughton Bystander’, and we hope the bystander does not mind. In some parts of Northamptonshire Tanders was not associated with lacemakers. In Broughton 54 people were bound over to keep the peace in 1930 after a night ‘tandering’, and a further 14 Broughton residents received summons to appear before Kettering magistrates in 1931 for celebrating Tanders too loudly. The crowd, estimated by the police at 1000 strong, had wandered the streets after midnight, banging tin cans and saucepan lids. The background to this mass demonstration was that the Parish Council had banned ‘tandering’, despite an overwhelming local referendum in favour of its maintenance: Saint Andrew being the patron of village church. 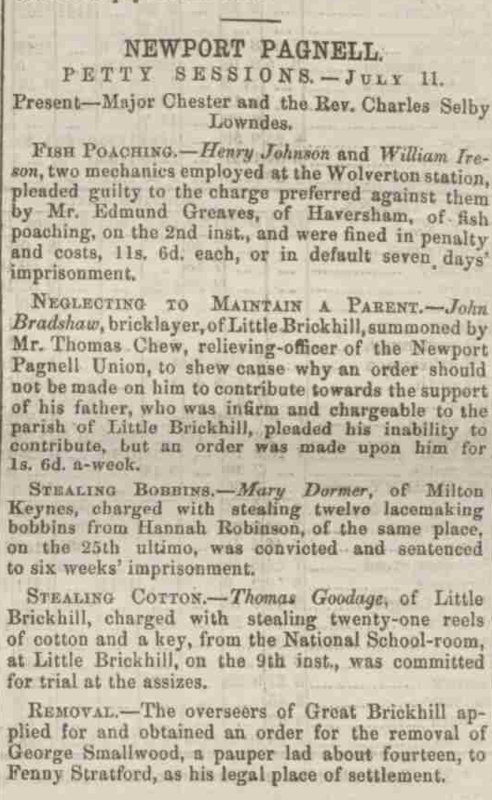 None of those arrested were lacemakers; in fact there was only one woman among them, a fourteen-year-old ‘tailoress’ who was discharged as too young to be put through the trauma of a magistrates’ court hearing. 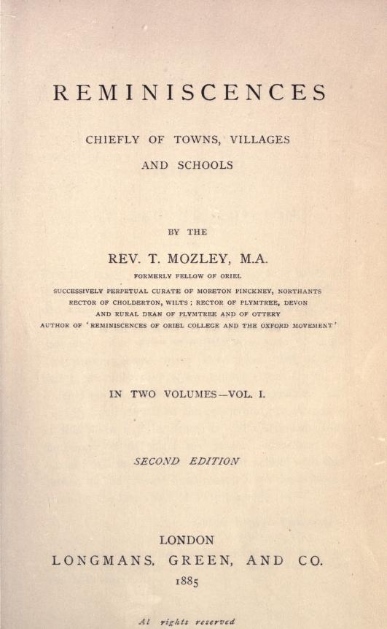 The local magistrates obviously did not understand the custom, and in 1930 they assumed that this was a form of ‘rough music’ (a type of popular justice used to shame those who had broken the unspoken rules of community life, akin to the ‘Skimmington Ride’ which features in Hardy’s The Mayor of Casterbridge). In 1931 the defendants hired a Northampton lawyer, Mr Burton, who argued, successfully, that Tanders was a traditional custom, always celebrated on the Sunday closest to ‘Old Saint Andrew’s’. The defendants were discharged on the basis that, as the magistrates instructed, ‘nothing of the same kind occurs next year’. However, the revival of Tanders at Broughton continues still with a tin can band and other night-time revels (the website In search of traditional customs and ceremonies has some pictures of the band in action from 2014). Of all the numerous red-letter days which diversified the lives of our ancestors, this is the only one which has survived to our own times in anything like its pristine character. St Andrew appears to be looked upon by the lace-makers as their patron saint; which may perhaps account for the estimation in which his festival is held. In many places, where progress has not yet shown her face, the day is one of unbridled licence – a kind of miniature carnival. Village ‘scholards’ bar out their master; the lace-schools are deserted, and drinking and feasting prevail to a riotous extent. Towards evening the sober villagers appear to have become suddenly smitten with a violent taste for masquerading. Women may be seen walking about in male attire, while men and boys have donned the female dress, and visit each other’s cottages, drinking hot ‘eldern wine,’ the staple beverage of the season. Then commences the Mumming, too often described to need mention here, save to note that in the rude drama performed in the Northamptonshire villages, St George has given place to George III, and the dragon, formerly the greatest attraction of the piece, been supplanted by Napoleon, who is annually killed on this night in personal encounter with the aforesaid monarch, to the intense delight and edification of the loyal audience. Fifty years ago, in a little village of Bedfordshire there was great excitement amongst the pupils of the ‘lace school’ one cold November morning. The school dame had no need to scold that day for idleness, or for tardiness in arriving; all had come punctually, and worked with a will. For this was ‘St. Andrews Day,’ or as the lace-makers termed it ‘Tanders’ which brought a half holiday for them all. So the heads were bent over the lace pillows, and the quick fingers picked out the pins and stuck them in again rapidly that a novice would think it looked like play. Ah! but each pupil knew how much she can do in an hour; and she also knew that if she loitered or idled in the least, she could never make up for the lost time. For this lace making cannot be hurried; every stitch must receive the orthodox number of twists and crosses of the bobbins, to make good saleable lace. It was no uncommon thing for the ‘lace buyer’ to take off one half-penny in the yard if a lace was ill-made or not a pure white colour, and this was a consideration of much moment in days when halfpennies were so scarce. Holidays were almost as scarce as half-pennies; hence the unwonted attention of ‘Tanders’ morning fifty years ago. At last the welcome hour of twelve arrived, and one by one the pupils prepare to go home. Bobbins are carefully parted and pushed back each side of the pillow to prevent tangles. The ‘drawer,’ or narrow strip of patchwork is drawn over the lace to keep it spotless; a ‘cover,’ also made of print pieces, is pinned over the lace pillow, and work is over for the day. What a merry time they have! Let us look into one house and see how the lacemakers keep ‘Tanders day.’ The table, chairs, etc., are removed, and the ‘house-place’ cleared; for this is to be no stiff ceremonial party as we shall see. Someone has brought the ‘blades’ of a bobbin wheel, used in non-holiday times to stretch the skein of thread while winding. The ‘blades’ consist of two pieces of wood crossing each other in form like the letter X. The four points of the ‘blades’ being sharpened, a quarter of an apple is stuck on three points, and a piece of tallow candle on the fourth. Now the fun begins; the blades are suspended by a string from the ceiling. one of the party being blind-folded, the hands are tied behind, and as the blades are spun round the blind-folded one has to try to catch in the mouth a piece of apple from one of the points. Great is the fun and delight when, instead of a bite of apple, a bite of candle is taken. But much good temper prevails, and all are willing to take their turn at the ‘snap-apple,’ and so passes the amusement round. But now, the supply of apples being exhausted, and everybody tired of romping, the ‘snap-apple’ is abandoned, and the making of ‘Tanders’ sweets’ begins. These were days when dentists were almost unknown to country folk. Was this due to the fact that sugar was 5d a lb., and sweets regarded as a great luxury for the children? Whether this was so or not, the ‘Tanders’ sweets’ were good and wholesome, and coming only once a year they were in the eyes of the youngsters delicious. Brown sugar, and a very small lump of butter were the ingredients used in making the sweets, and until the boiling process was over everyone was in a state of great excitement and fear, lest the sweets should ‘turn to sugar’ and burn. The boiled sugar being poured on to a floured dish, each one had a hand in rolling or cutting sweets, and putting them by to cool. The next morning was a trying time to the School Dame. Every lace-maker brought specimen’s of ‘Tander’s sweets’; some burnt black, some sugary, some clear as candy, and all exceedingly sticky. In vain does the School Dame threaten to ‘keep in’ and ‘tell your mother.’ The delinquents still eat sweets and muse on the joys of ‘Tander’s Day,’ thinking dismally what a pity it is that they have to wait a whole year before it comes again. Is it a pity? I think not. 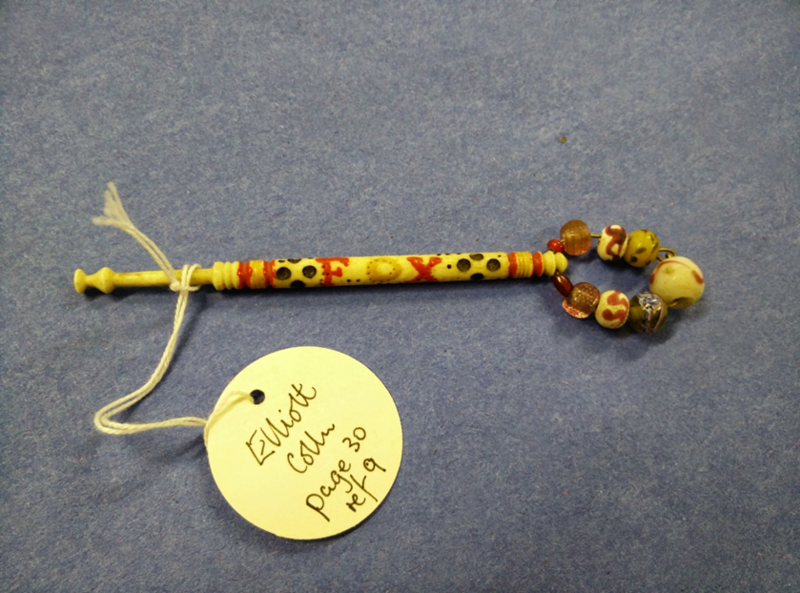 A lacemaker’s bobbin winder from the Pitt Rivers Museum (1911.29.17). 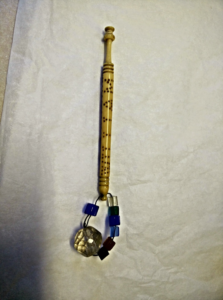 It was collected by Percy Manning from Maria Woods of Launton near Bicester (Oxon) in 1894. The blades suggest a St Andrew’s Cross, perhaps the reason for its use in games on Tanders. If you won’t give a holiday, We will not let you in. After a brief display of counterfeited anger the mistress would give way, and the pupils had their half-holiday. The mistress was pretty severe, carrying a cane, and often giving them a cut if they behaved badly, and it is more than likely, says my informant, that they from time to time deserved it. Cream the yeast with the teaspoon of sugar and blend in the water. Leave the yeast to froth and bubble, then mix with the beaten egg and add to the flour. Pour in the cooled, melted lard, and mix until smooth. Knead well, cover and leave to double in size. Knock back the dough and knead in the currants, sugar, and peel. Transfer to a greased 2lb/1kg loaf tin. Leave to rise until the dough reaches the top of the tin. 20-30 mins. Then back to oven for 60-70 mins until well risen and golden. 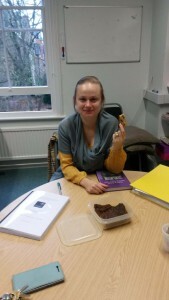 Nicolette ‘enjoying’ David’s attempts to bake a Tanders cake. Anne Elizabeth Baker, Glossary of Northamptonshire Words and Phrases, With Examples of their Colloquial Use, And Illustrations from Various Authors: To Which are Added, the Customs of the County (London: John Russell Smith, 1854). Kate Leila Edmonds, ‘The Lace Makers’ Patron Saint. Fifty Years Ago’, Bedfordshire Times and Independent, 16 February 1900. Kate Leila Edmonds, ‘St. 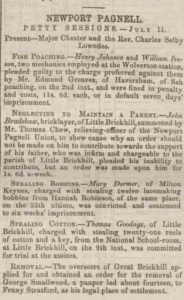 Andrew’s Day or “Tanders”,’ Bedfordshire Times and Independent, 24 November, 1905. Rev. E.R. Grant (Unitarian minister of Northampton), text of talk given on ‘The Legends and Folk-Lore of Northamptonshire’ at Northampton Town Hall, reported in the Northampton Mercury, 13 March 1880. Dorothy Grimes, Like Dew Before the Sun. Life and Language in Northamptonshire (Northampton: Dorothy Grimes, 1991). Julia Jones and Barbara Deer, Cattern Cakes and Lace: A Calendar of Feasts (London: Dorling Kindersley, 1987). ‘M.E.R’ [Margaret Emily Roberts], ‘Spratton Lace School’, Northamptonshire Notes and Queries, 4, 1892. ‘Tin Can Band in Court: Broughton Mummers who Celebrated “Tander”,’ Northampton Mercury, 2 January 1931. Thomas Sternberg, The Dialect and Folk-Lore of Northamptonshire (London & Northampton: John Russell Smith, 1851). Thomas Wright, The Romance of the Lace Pillow (Olney: H.H. Armstrong, 1919). In her Victorian heyday Charlotte Mary Yonge (1823-1901) was as popular and as prolific a novelist as Dickens and Trollope. She has fallen out of fashion somewhat since, despite the efforts of the excellent Charlotte Mary Yonge Fellowship, whose website we recommend. Although a witty and lively writer, especially of dialogue, it was Yonge’s social and religious opinions which drove her plots, and explain why they feel so dated. This can be illustrated by the example of The Clever Woman of the Family, but our reason for including it in this series of blogs on lacemakers in fiction is because it also offers a picture of the Devon lace industry in the high Victorian period. Charlotte Mary Yonge, by George Richmond, 1844. Yonge’s novel opens in the early 1860s on Rachel Curtis’s twenty-fifth birthday. She is the daughter of a gentry family in the fictional Devon fishing and resort village of Avonmouth and, in her own opinion at least, the clever woman of the family. But she can find no outlet for her intelligence and her energies because she is “tethered down to the merest mockery of usefulness by conventionalities. I am a young lady forsooth! — I must not be out late; I must not put forth my views; I must not choose my acquaintance; I must be a mere helpless, useless being, growing old in a ridiculous fiction of prolonged childhood”. 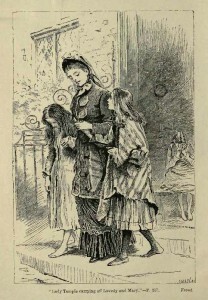 The primary objects of Rachel’s desire to be useful are the “hard worked, half-stifled little girls” in the local lace schools: “cramped in soul, destroyed in body, that fine ladies may wear lace trimmings”. It galls her that a charitable bequest by one of ancestors in the seventeenth century actually pays for the girls’ apprenticeships. At the moment the only support she is able to provide is by purchasing their products, even though she describes lace as “cobwebs of vanity” (while her mother detests “that black lace thing, that looks fit for your grandmother” which she is obliged to wear as a consequence of her philanthropic consumption) and reading to the lacemakers in their schoolroom. This location is a “black-hole under the stairs” without windows where the local lace mistress keeps seven children in rigid silence for ten hours a day. Rachel reads them something religious, something improving, and a bit of a story, alongside mental arithmetic which, according to the author “was about as interesting as the humming of a blue-bottle fly” to its “well-broken” denizens. The idea that one must be “broken to lace” recurs throughout the book. Rachel is particularly exercised by the fate of one intelligent girl, Lovedy Kelland, whose mother had refused to sacrifice her little girl “to the Moloch of lace” but instead sent her to school. There were even hopes she might become a trainee teacher. But when her mother dies, the girl is adopted by the lace-mistress “with the resolve to act the truly kind part by her, and break her in to lace-making.” But while Rachel is infuriated by Lovedy’s fate, her real ambition is to attack “the system… that chained girls to an unhealthy occupation in their early childhood, and made an overstocked market and underpaid workers”. “Lace and lacemakers are facts,” she explains to her distracted cousin Fanny, “but if the middle-men were exploded, and the excess of workers drafted off by some wholesome outlet, the price would rise, so that the remainder would be at leisure to fulfil the domestic offices of womanhood.” However, her wealthy neighbours have no desire push up the price of lace, and the lacemakers themselves are drawn to Primitive Methodism to escape the well-meaning interference of local do-gooders; they only tolerate Rachel because of her family’s historic position in the community. Her opportunity to act comes through a chance encounter with Mr Mauleverer, a philanthropic lecturer and, it is implied but never quite established as fact, a clergyman unable to find a position because of his modern “opinions”. With his encouragement she launches the Female Union for Lacemaker’s Employment (the initials are not inconsequential, and the name is later changed to the Female Union for Englishwoman’s Employment or F.U.E.E. ), gathering funds from near and far to support an Industrial School for the former lacemakers where, as Rachel explains “some fresh trades might be taught, so as to lessen the glut of the market, and to remove the workers that are forced to undersell one another, and thus oblige the buyers to give a fairly remunerative price.” A magazine is launched under the banner “Am I not a Sister?” (a reference to the famous slogan of the slave emancipation movement at the turn of the century, “Am I not a Man and a Brother?”). Premises are found nearby, a matron employed, and two lacemakers, including Lovedy Kelland, are taken in with the promise of becoming wood-engravers. Sadly, Mauleverer turns out to be a con-man who pockets the monies raised by Rachel, while the matron is a vicious tyrant who starves the girls while forcing them to make sprigs day and night, beating them with a stick if they failed to fulfil their quota. The deception comes to light when Mauleverer presents two woodcuts, which he claims were engraved by the F.U.E.E’s trainees, jointly entitled “The free maids that weave their thread with bones” (the Shakespearean description of lacemakers). One woodcut, depicting a pretty maiden outside a cottage door with roses, honeysuckles and other “conventional rural delights” is labelled “Ideal”; the other, showing “a den of thin, wizened, half-starved girls, cramped over their cushions in a lace-school” is labelled “Real”. Rachel’s friends prove to her that in fact both images had been snipped out of an old copy of the London Illustrated News. However, this revelation comes too late for the beaten, emaciated Lovedy who dies of diphtheria soon after her release. Her last words to Rachel as watches over her deathbed are “Please tell me of my Saviour”, but Rachel finds she cannot, so far has she drifted from the verities of the established Church. (On the whole the poor in Yonge’s novels do not provide moral lessons to the rich, as they do in Charlotte Barnard’s work: this scene is an exception.) Lovedy’s death is only one of several shocks to Rachel’s image of herself as “the clever woman of the family”, but it is the most brutal. “Lady Temple carrying off Lovedy and Mary”. Adrian Stokes’ illustration from the 1880 edition of The Clever Woman of the Family depicts the moment when Rachel’s cousin intervenes to rescue two girls from “the Moloch of lace”. Yonge sincerely believed in male superiority, and for many years opposed developments in women’s education. This is surely one reason that her works have fallen out of fashion. She was a tireless proselytizer for the Church of England in its most High Church, Oxford Movement garb. Although her characters are more rounded than Barnard’s and More’s ciphers, the moral message of her work is hammered home in chapter titles and epigrams. But perhaps even more off-putting is her absolute acceptance not just of social inequality — even for the exemplar of modern intellectual trends Rachel Curtis, class hierarchy is a given — but also social conventions. This is a novel in which the characters can spend the best part of the chapter discussing whether it is appropriate for a young widow to play croquet. Although in the text the partisans for the game carry the day, the author reveals her own allegiances when later the initiator of the craze in Avonmouth, a fashionable but wilful and selfish young woman, is killed in a freak croquet accident. Lace-making is a background theme of the novel – the motor of Rachel’s enlightenment rather than a topic in itself, and it fades out completely in the second half of the book. Nonetheless it is clear that Yonge knew something of the trade. Her family came from Devon and she often holidayed there. She was certainly familiar with the vocabulary of the Honiton lace industry, such as “sprigs” for the patterns made by the lacemakers, and “gapsies” for the illicit breaks observed in the lace school. But if some knowledge came from direct observation, it is likely that she had also read the report of Commissioner John Edmund White on the lace industry (1864) as part of the Royal Commission on the Employment of Children and Young Persons in Trades and Manufactures not already Regulated by Law. White confirms, for example, the importance of the apprenticeships to lace mistresses in Devon (compared with the Midlands). Apprentices would be trained for a year and half or so before they could start making money on their own account. Yonge’s description of a lace school is also similar to those visited by White. For instance, Mrs Besley’s lace school at Seaton was an annexe to her cottage, “nearly square, a little over seven feet each way, and six feet six inches high, and containing, in fact, a little over 330 cubic feet, and there is no fireplace or means of warming”. This tiny space was shared by seven pupils, the mistress and her three daughters, working from early morning till at least 10:00pm, and often much later or even all through the night. As another lace mistress, Mrs Croydon, put it, “If you promise the work, you must do it” regardless of what strain it caused the young girls. Yonge’s Mrs Kelland would doubtless have agreed. 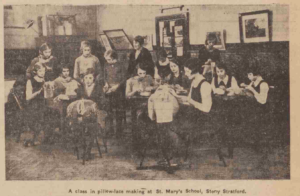 Girls started in these lace schools as young as four or five, though they were normally not expected to do a full day’s (and night’s) work until aged seven. Work would start at six or seven in the morning, and those mistresses like Mrs Copp of Beer who closed at ten in the evening, summer and winter, obviously considered themselves philanthropic for not keeping the girls later. The term school is something of a misnomer as most appear to have provided no education beyond lace skills. Hence the effort that Rachel Curtis puts into night schools and Sunday schools, where lacemakers might learn their letters, even though she felt that such efforts were only “scratching the surface”. Commissioner White was shocked by the levels of ignorance he encountered: for example, thirteen-year-old Emily Westlake, whom he interviewed at Mrs Besley’s school, “Knows the letters (and no more), but no figures (when shown) except ‘1’.” Yonge highlights this mental cramping in the character of Susan Kelland, daughter of the lace-mistress, “who was supposed to be a sort of spider, with no capacities beyond her web.” White highlighted the deleterious health effects of such children “crumped up” (to use the local term) over pillows in such ill-ventilated, stuffy rooms, alternatively too cold or too hot, for hours on end. The girls suffered from headaches, they damaged their eyes, and in some cases even died of brain fever from over-taxation. All this to earn between a shilling and, at most, even for the most adept, three shillings six pence a week (by way of comparison, in this region of very depressed wages, a male agricultural labourer might earn eight shillings a week on average). The description of the lacemakers’ sufferings at the hands of the F.U.E.E.’s matron Mrs Rawlins –beaten, forced to work through the night, and in effect starved to death – also recalls accounts of the Barratt case of 1856, which Yonge may have read; it was certainly covered in her local newspaper. Like the Barratt’s sister and parents, Mrs Rawlins would be tried for manslaughter at the assizes, and in her case sentenced to one year’s hard labour. Yonge is sniffy about Rachel Curtis’s desire to reform the system (“everything was a system with Rachel”) rather than, at most, relieve the symptoms of poverty (a much more proper activity for upper-class women). However, The Royal Commission’s report made it obvious that manufacturing’s reliance on child labour could not be ameliorated by private charity alone, it could only be addressed through legislation. Its first fruit was the Workshop Act of 1867, which stated that no child under eight could be employed, that children between eight and thirteen could work no more than six hours a day, and all employed children should get ten hours of formal schooling a week. Further regulation of workshops, together with new educational requirements, would effectively kill off the lace schools over the next two decades. British Parliamentary Papers, House of Commons, First Report of the Commissioners on the Employment of Children and Young Persons in Trades and Manufactures not already Regulated by Law. 1863. As far as lace manufacturing is concerned, the findings of the Commission are usefully summarized in a more accessible pamphlet: Alan Brown, Take the Children: How Victorian Lace Girls Lived and Worked in the Honiton and East Midlands Districts — This is their Story, as Told to the 1862 Royal Commission (Sawbridgeworth, c. 2000). Janice Fiamengo, “Forms of Suffering in Charlotte Yonge’s The Clever Woman of the Family”, Victorian Review 25:2 (2000); 85-105. H.J. Yallop, The History of the Honiton Lace Industry (University of Exeter Press, 1992).